As you may be aware, the tech news headlines over the past week have been dominated by the new strain of ransomware called "WannaCry". This ransomware leverages a bug in Microsoft Windows computers which encrypts all of your data then requests payment in Bitcoin. Those of you who have been following this blog over the years would recognise the modus operandi of this ransomware being very similar to that of the original Cryptolocker ransomware. There is nothing technically different about this ransomware however, the method of infection and the amount of Bitcoin requested differ from the original Cryptolocker ransomware. Ransomware usually infects a computer when a user opens a phishing email which then infects that computer with WannaCry. Once installed, WannaCry uses the EternalBlue exploit developed by the U.S. National Security Agency (NSA) to spread through local networks and remote hosts, that have not been updated with the most recent security updates, to directly infect any exposed systems. The infected computer then displays a message which demands a ransom for the decryption of your data. What's different about WannaCry is that it demands only $300US worth of Bitcoin (which doubles after 3 days if not actioned). This is considerably less than previous ransomware products which can easily demand 4-5 times that amount of Bitcoin. A "critical" patch had been issued by Microsoft on 14 March 2017 to remove the underlying vulnerability for supported systems, nearly two months before the attack in May, but the affected organisations had not yet applied it. For those of you on Loyal I.T. 's Managed Services, the installation of these patches has been performed automatically and as a result, those PC's and servers that are managed, are not vulnerable to this attack. Loyal I.T. 's recommended antivirus product, Vipre Antivirus, detects and quarantines WannaCry before it can encrypt any data. As we follow Microsoft's Best Practices, all PC's and servers we setup have Windows Updates configured and activated. However, if you would like Loyal I.T. to confirm the patches have been applied to your systems, please contact us on 02 4337 0700 or email help@loyalit.com.au to log a ticket. Did you know that over 60 million computers will fail worldwide in the next 12 months? 1 in 10 computers will be infected with a virus every month? 29% of disasters are caused by accident? What would you do if you lost everything? It's a scary prospect considering that 30% of people have never backed up their data! Don't let this happen to you. Is your data recoverable if there was a disaster? Who checks your backup to make sure it is working? If you answered "I don't know" to any of these questions, Loyal I.T. Solutions can help. Our offsite backup solution ensures your data is backed up, recoverable and that a human checks your backup status daily. Also, any backup maintenance required is included in the low monthly cost. For the month of April, we are offering free installation and 1 month free of our offsite backup service ($400+ saving). Call us to discuss your backup needs. Place an order with us in what we are calling "World Backup Day Month" to secure your special pricing. To learn more about World Backup Day visit the website: http://www.worldbackupday.com. 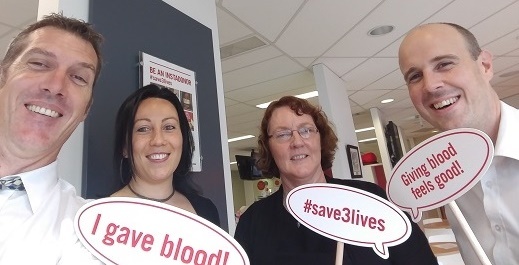 It was a dark and stormy Tuesday afternoon in mid-March, 4 dedicated Loyal team members made a sudden (but planned) attack on the West Gosford Blood bank to donate their exquisite blood. We entered the building with pride & courage due to the support we have for our dear friend and teammate Adam King. Mick was the first in line, "Mr. Boss Man" was on the frontline, he rolled up his sleeves and ended up having to get stabbed twice for his blood to flow. He was ever so fearless, but in the back of his mind was the thought of the most amazing milkshake he would make himself as a reward for his bravery. Next it was Naomi, she was confident when she entered the screening test, however she was knocked back into place as she was told that she had low hemoglobin levels (first time ever) and had to have further testing before she was allowed to donate she passed, as it was a false reading and has battle scars on both arms to prove she was there in the battlefield. MT, was third in line. 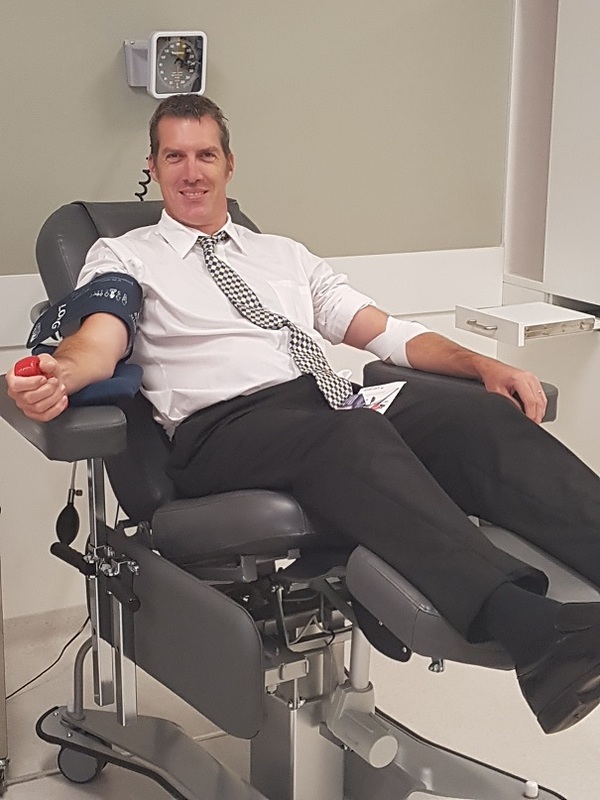 He was all prepared to be denied the privilege, however they surprisingly found nothing wrong with him, he had ticked all the right boxes and was marched to the donating chair. With a little apprehension in his eyes, he manned up and took one for the team. Then it was lucky last, Raewyn a newbie to the Loyal donating team, however she was imagining she may not pass the test phase and would just enjoy the treats while watching us suffer. 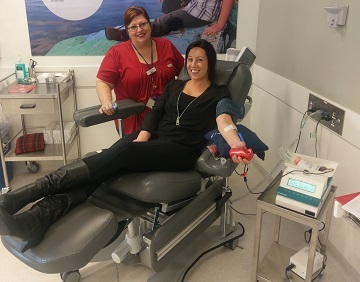 Raewyn was given the green light and was rearing to go, we heard a little nervous laugh as she was making her way to the chair, while hooked up to the blood sucking machine, Raewyn was told she had amazing veins and had completed her mission in less than 6 minutes. All of us then met up at the break area, Mick made that milkshake he was visualising, MT complained that Naomi took the last chocolate muffin, but then decided that blue berry was going to be pretty satisfying, Raewyn was given "Queen" like treatment from one of the staff members offering to make her a milkshake, Mick was disappointed he couldn't show off his talents with how he can transform milk into so much more.. A milkshake!!! We all enjoyed our outing, our task, our mission, and hopefully we helped save 12 unknown lives today!!! 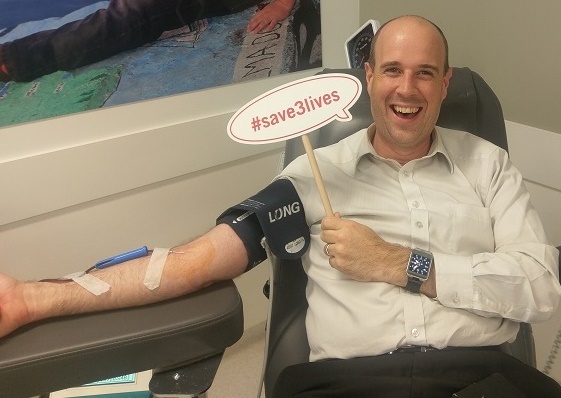 Late last year the team rolled up their sleeves and gave blood again. Well, most of us did. 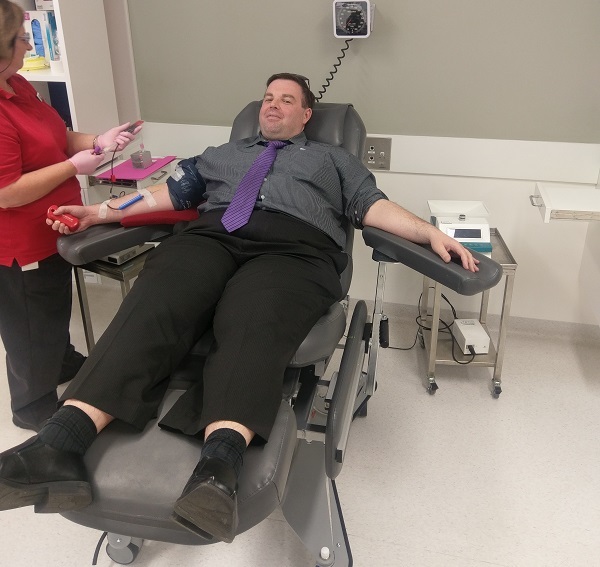 Unfortunately, Michael Trimblett was denied the ability to give blood this time. No, it's not what you're thinking. That's right, it was to do with some risky out-of-hours activities that left him with sores on his knees. Before you jump to any conclusions, it was from playing Soccer 5's as goal keeper. The wound was so innocuous it was nearly not mentioned on the screener form. 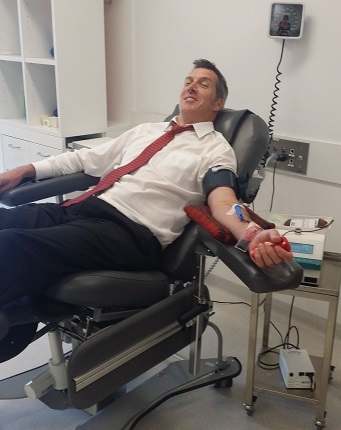 Luckily it was and the woman performing screening assessed it as too much of a risk for those requiring the blood. As we would go on to learn, any form of infection that could be carried by blood, no matter how small, could have harmful effects on those receiving the blood. This is why you must declare anything and everything that may cause ill-effects, not matter how small. 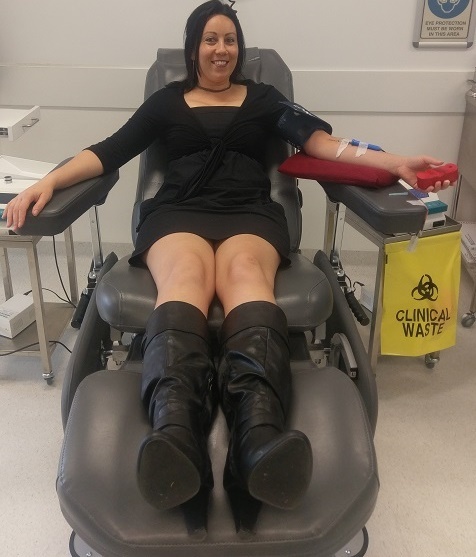 Naomi and Michael Goodwin (those who actually gave blood this time), were joined by a newcomer from the Loyal I.T. office, Brendan Lewis. 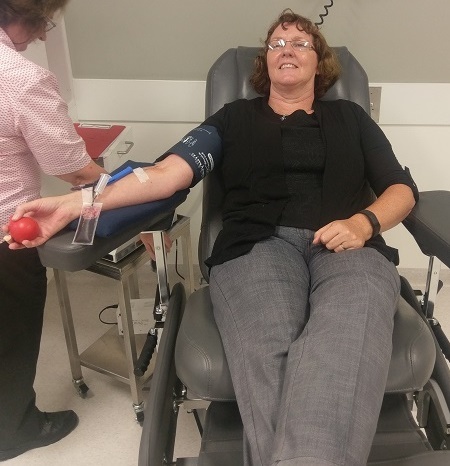 Hats off to everyone who gave up their blood and to Mick and Julie Goodwin for allowing our team the time to give back to the community. Life-saving tally to date stands at 33! Loyal I.T. Solutions will be closed from midday December 23rd through to 8:30am on Monday January 9th. We will have select members of our team available for emergencies between these two dates. Should you require assistance in that time please contact our office on 02 4337 0700 for instructions. We thank all of our clients for your continued support during 2016. Wishing you and your families a very Merry Christmas and all the best for 2017. It was the best #@! *# thing we ever did, changing over to you guys.